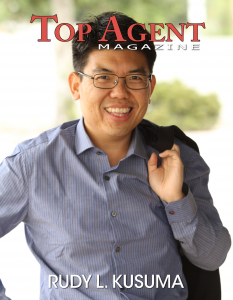 ROSEMEAD, CALIFORNIA, UNITED STATES, March 22, 2019 /EINPresswire.com/ — Rudy Lira Kusuma, an award-winning real estate professional from Titanium Real Estate Network, is pleased to announce that they have been featured on Top Agent Magazine on its March 25, 2019, edition. Top Agent Magazine is the number one real estate magazine featuring the best professionals in the real estate industry. These can include property managers, insurance agents, mortgage professionals, real estate agents, and real estate attorneys in different parts of the world. It recognizes amazing people who excel in the industry from the USA, Australia, New Zealand to Canada. “The chance to be featured on Top Agent Magazine is an honor. With the recognition, we will remain committed to provide the best services among our valuable home buyers and sellers across Greater Los Angeles County and other surrounding areas. We will strive to deliver responsive and relevant solutions at a competitive rate,” Rudy L. Kusuma said. “Finding a new home or selling a property can be challenging to handle. This is especially true when clients deal with the process themselves. Rudy L. Kusuma Home Selling Team has been formed to streamline the process. While people can make a successful purchase or selling experience, the procedure will be as quick as possible,” Kusuma further added. Rudy L. Kusuma Home Selling Team is not the typical real estate expert in Greater Los Angeles County and other nearby places in the US. They are advanced in terms of expertise, knowledge, experience, and technology, making them the most trusted specialist. Home sellers and buyers have been working with traditional real estate brokerage. What they don’t know is that the process can be long. It does not take overnight. Also, the services can be costlier than expected. Rudy L. Kusuma Home Selling Team prides themselves on their modern and quality solutions. More than that, they do not do everything on their own. They work together to reduce hassles, shorten the process, and provide suitable offerings. Serving the industry for years now, Rudy L. Kusuma Home Selling Team takes great pride in their people. They have professionals that specialize in administration, marketing, transaction, finance, information technology, and accounting. All members focus on their responsibilities. What many clients love about them is that they are dedicated to supporting home buyers and sellers with their transaction from start to finish. Since its inception, Rudy L. Kusuma Home Selling Team has a passion for gathering leads. With their efforts during the day one of operation, they now have more than 35,000 potential buyers. So, finding the right seller or buyer will be stress-free. Rudy L. Kusuma Home Selling Team is a company that specializes in real estate buying or selling. They have the right people, the most effective process, and the best technology for all. For more information, please feel free to contact them at 626-789-0159!